We were excited about the future of GiftCards products, that's why we created GiftCards.eu. Our short history began in 2008 and every year since we have increased our revenue with 60%. The GiftCards.eu website is unique with its possibilities to ship GiftCards Mastercard or VISA . No matter where you live Germany, Bulgaria, Spain, you can buy and receive a Plastic GiftCard Mastercard or VISA. We ensure the high quality of GiftCards service and provide great flexibility to our customers to choose different designs, values, packages, support languages, currency, points of shipping. Each customer is important to us. For the corporate customers we offer some special additional services - discounts, branding of the card and packaging, delivery tracking and additional security. We have a vast experience when it comes to corporate use of GiftCards and provide advice and consultation to our corporate clients and their needs. We believe in the world trends which envisage that GiftCards will replace the conventional gifts and the paper vouchers because of the obvious advantages of Giftcards products. We ensure high quality services and cutting edge functionality thanks to our Great team and Know-how. Our GiftCard team of marketing, finance, management, operation and IT proffessionals invests great care in the perfect performance of all GiftCards.eu services - producing, personalization, branding, packaging, selling, shipping and cards operating. We guarantee perfect customer communication, prompt reaction and quality support. 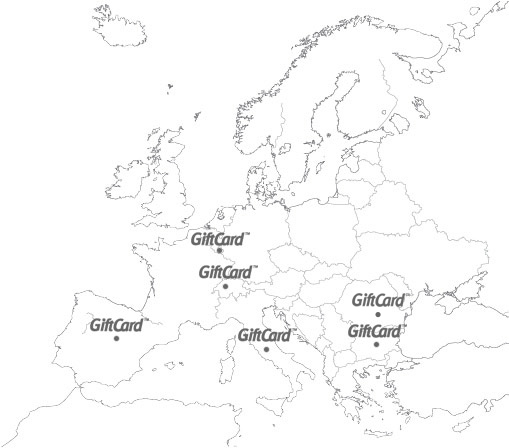 Our goal is to make GiftCards.eu one of the most preferred web market place for prepaid GiftCards all over the world. Visit our website as often as possible and you will always be surprised with new card designs and gift ideas. GiftCard,VIRTUAL GIFTCARD, eGIFT are registered trademarks.